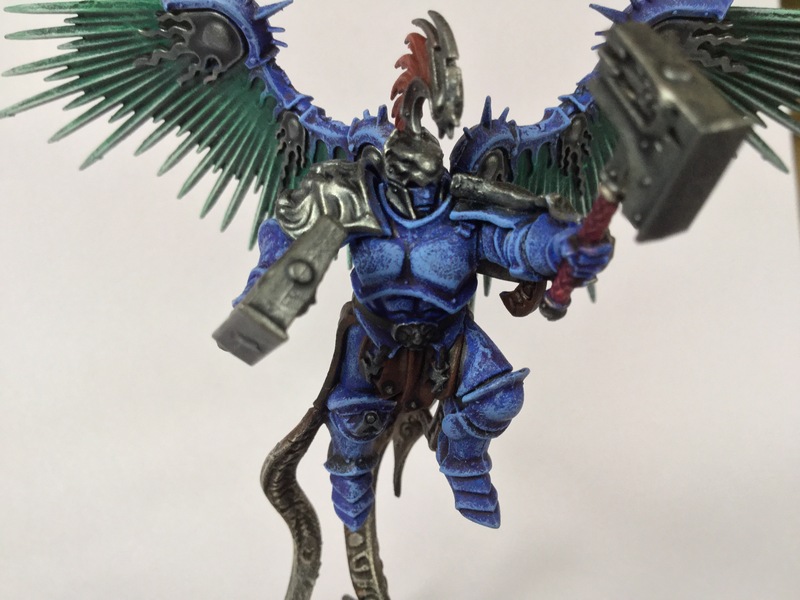 As the war for the Grey-name dynasty continues, Joining the Lords of the Pisces are the angelic hammers of Sigmars wrath, the Prosecutors. 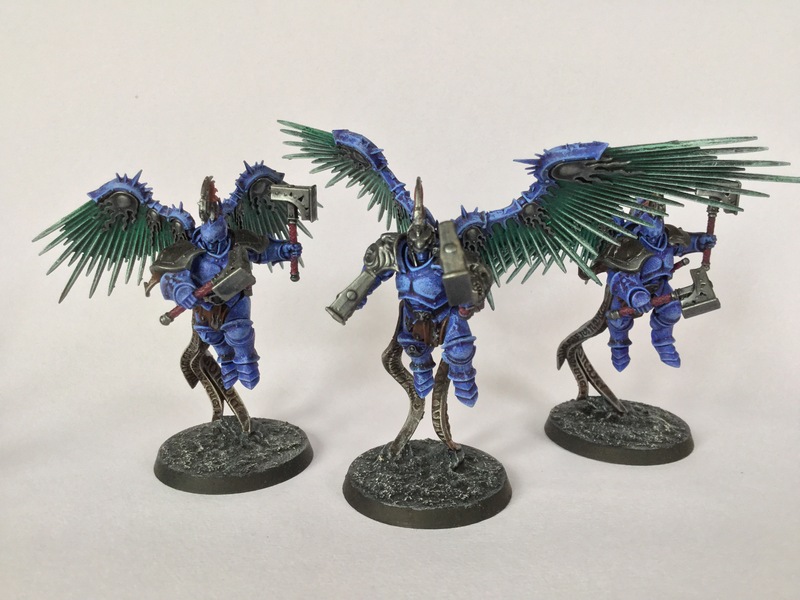 These flight gifted warriors are seen as a sacred role in the stormhost, having ascended from the sea of eternal cycle to become the predators of the sky. Prosecutor prime, Tikor, leads his men to scout the outer bastions of the land, seeking to find any enemy territory and finding any weaknesses for the ground troops to target. One of my favourite sculpts from the Stormcast Eternals range, it’s hard to believe that eight years from starting this hobby, would I see the major improvements of quality the sculptors have achieved. comparing this unit to the Dark Elves Manticore and Harpies is quite a big difference on how sculpting was done. Painting this unit was pretty simple, since the colour scheme is the same as my previous entries for the army. The wings however was a new area for me, since its texture and form is meant to reflect on its sculpt as wings of pure light. The colour scheme is very similar to the Dracoth, although the application of paint is done in drybrush sections of transitional blend. 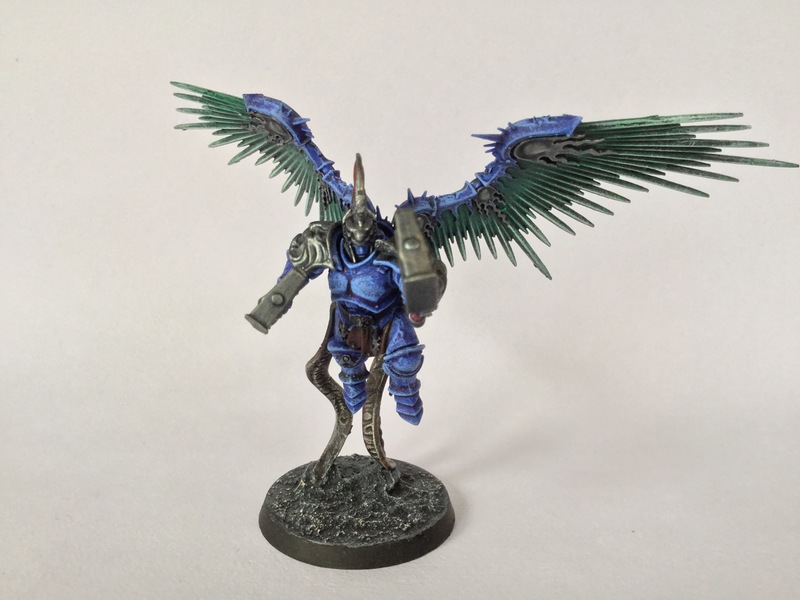 Whilst it’s not as simple as the quick methods many would use, I think the overall look of the wings are a fantastic contrast to the cold blue armour. Next time, I’ll be showing not one, not two, but all of my Dark Aelves I’ve painted so far! I felt it was finally time to jump the schedule and show the current progress on the collection. Today’s post is a short showcase of my sample work on 2D wire work, and how the samples look overal. The first wire work is based on one of the windows at Lincoln Cathedral. I found this to be difficult as threading a lot of wire can be tedious and fiddly to test with. Ill improve on making a wire frame that Doesn’t need as much threading. The second and final wire frame sample was based on a cornered wall from the Cathedral, which I wanted to recreate in wire form. As you can see from the image…….yeah…..best not elaborate on this attempt. Wire work is quite difficult for me to use unless it’s 3D, as it’s something I can do practically. Thank you for reading this short post. I’ll be back at some point this week with a new post. Until next time. This isn’t something I’d usually post, I generally keep my personal life and complications aside when it comes to blogging. Especially since my blog is focused more on hobby and art, rather than my life journey. However, things have been pretty difficult for me lately, trust has been broken, anxiety is creeping into my mind, people I needed help from most have turned away and feeling none existent until something bad or unexpected happens. Well, the unexpected happens in form of a mental breakdown/ sudden meltdown. I won’t go into the details of how this occurred, nor the place where it happens, but it all comes to the fact that things aren’t going well for me. The place I go to, I feel alone, like I’m not a person, just a none existent thing that’s at the back wall. Socialising is difficult for me, I can’t express much, nor can I talk to anyone without the lingering shadow that always brings me down. My stress levels are getting worse for me now that I have so much to do, my situation has stopped me from focusing on my tasks and it’s getting worse each week. I’m trying so hard to contain my frustration, but I can feel the pull of the chains getting weaker and weaker. I wish I could be like the average person, to not be weighed by my difficulties, to actually feel like I’m apart of something. To have the strength to defeat my anxiety and inner demons. But, I know deep down, I’m very much a lone wolf in life. If things don’t change, if I can’t voice my concerns louder nor fight for my very sanity, then I can only hope there’s something else out there worth holding onto. I thought sharing this would put my mind at ease for a few hours. I’ve made it vague enough so that no repercussions will happen to anyone around me. But, I can’t contain the weight I’m forcing myself to hold onto. There will be a new post next week, if all things go to plan. 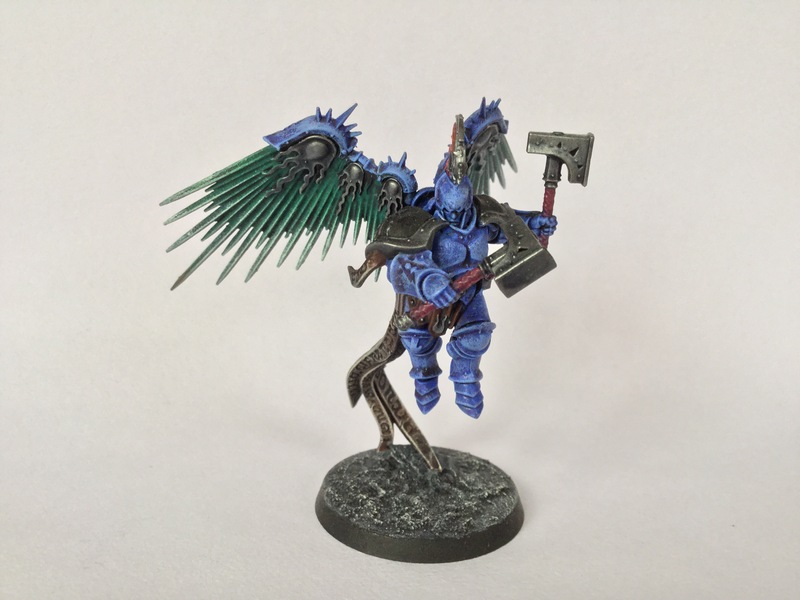 Welcome back to AoS faction collection, a continuing series where I present models I’ve painted each week, based on the faction I’m currently collecting. 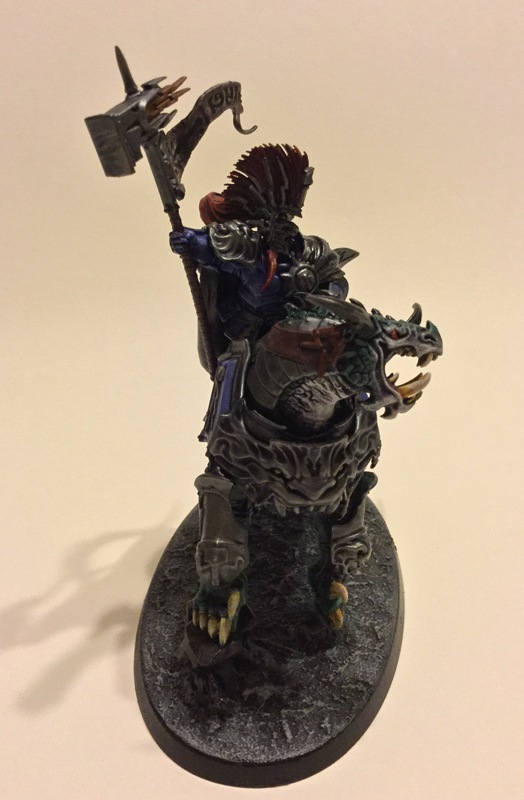 Since I’m feeling under the weather from the cold flu, as well as an ever growing backlog of models completed, I’ve decided to post an extra AoS faction collection. 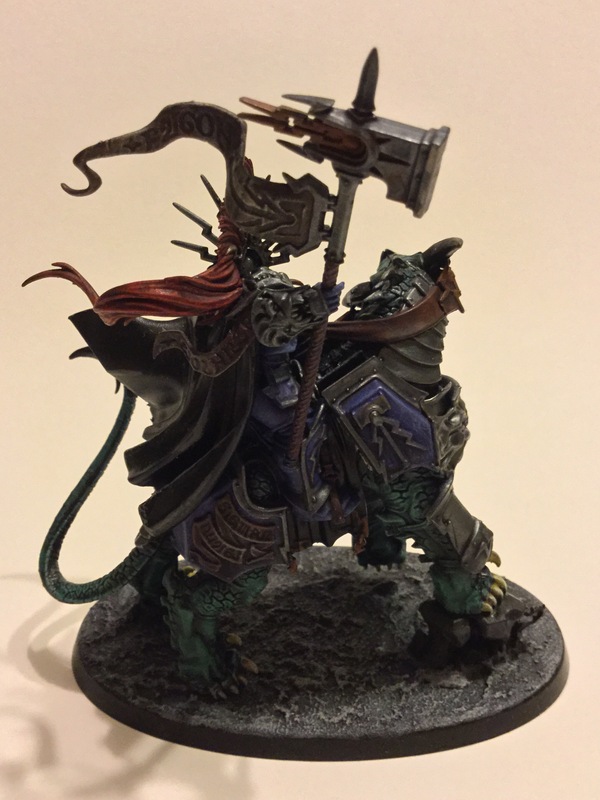 Today, I’ll be showing off my centrepiece for the army, a Lord Celestant by the name of Bjorn the Stormborn! This model was surprisingly tedious to paint at first, it’s not as simple as your standard liberator or SC hero. There was a lot to consider when painting this model, from the colour scheme for textures, tones and techniques to apply for the Dracoth. As well as how to paint the model for both the rider and mount without too much complications of inconsistency to the painting. I came to the conclusion that I’ll paint the dracoth first, as it’s the biggest part of the model to paint. I’ve used the black basecoat as a way of drybrushing over lighter paints for instant recess gaps. 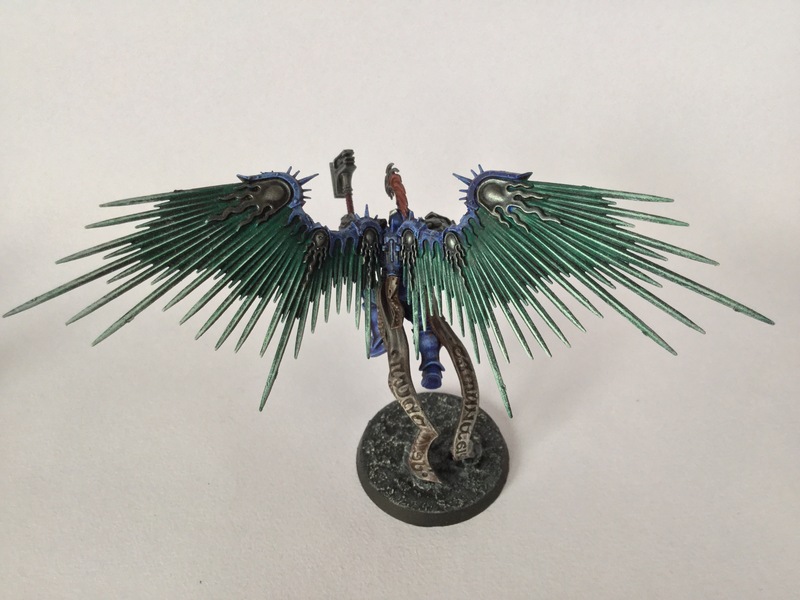 Once the Dracoth was done, I went on to paint the Lord Celestant without too much complication. Overal, painting the model in seperated parts helped me to overcome the task of painting this model. The colours chosen work well as contrast between the rider and beast, having a rich and mix tones of warmth (Dracoth skin) and coldness (Lord Celestant). If your interested in recreating the Dracoth I’ve painted here, or want to use the colour scheme for other models, here’s my colour guide below. Drybrush the model in Kabalite Green. Drybrush again in Sybarite Green. Mix 1/3 of Sybarite Greeb and acrylic model colour White and drybrush the neck and lower body. Use Druchii Violet shade on the lighter shade areas. Drybrush the shaded areas in acrylic model White. Basecoat the eyes in Evil Sunz Scarlet. Highlight the centre of the eyes in Ryza Rust. Carefully make a white dot at the corner of the eyes using acrylic model white. Basecoat the teeth in Yuriel Yellow. Shade the teeth in Reikland Fleshshade. Next time I’ll be covering my next Stormcast unit, the Prosecutors. 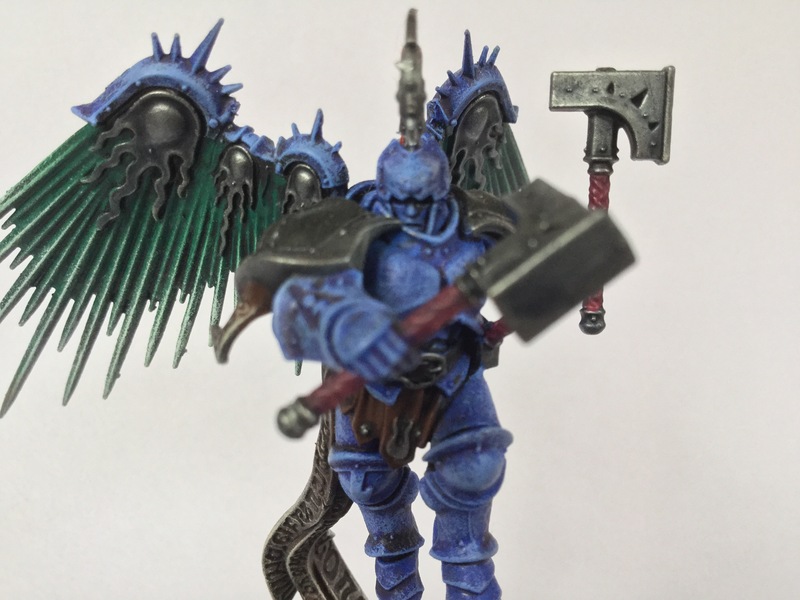 These winged warriors are a sight to see, their design looks absolutely amazing for today’s wargaming plastics. Sadly, the wings can be fragile to break, as I’ll elaborate on this in my next post. The Duardin of Barak-Nar have lend their aid to the Lords of the Pisces in their direst need. For the Stormhost need as many allies as they can rally to retake the lands of the once great Grey-mane dynasty. 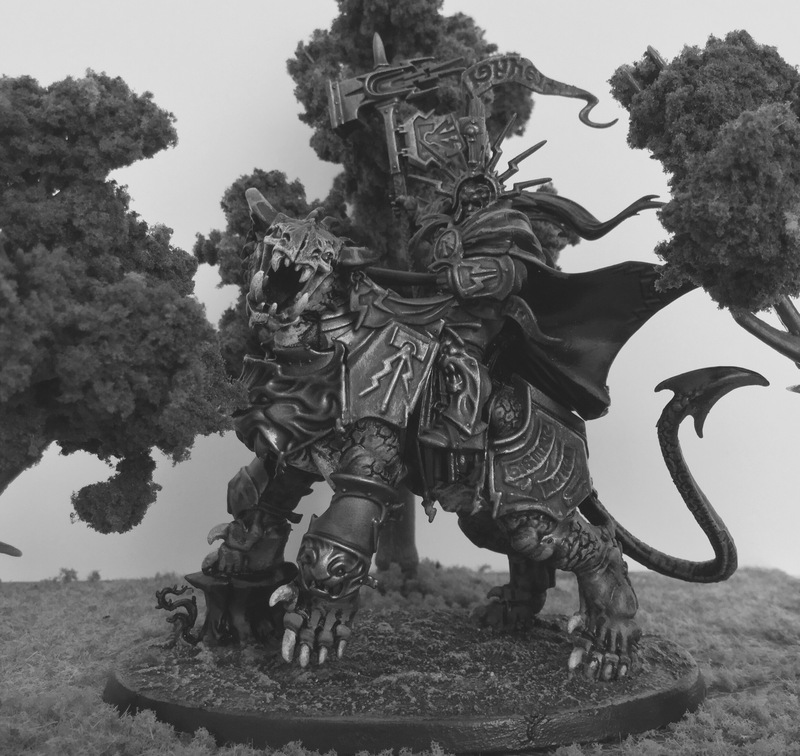 Led by the warrior chamber commander, Lord Celestant Bjorn the Stormborn, he seeks to retake his homeland and destroy his arch nemesis, the Mighty Lord of Khorne, Malthran. The Kharadron Overlords have seen great promise in this alliance of the Grey-manes Expedition, as the outcome can produce a future trade line for the navy. Taking on the request from the Stormcasts, Barak-Nar have offered to help the Stormhost with a privateer crew and their frigate. Whilst it’s only a small offering (for a high price in gold), it’s more than worth its fire power and capacity to smite the foes of Chaos. 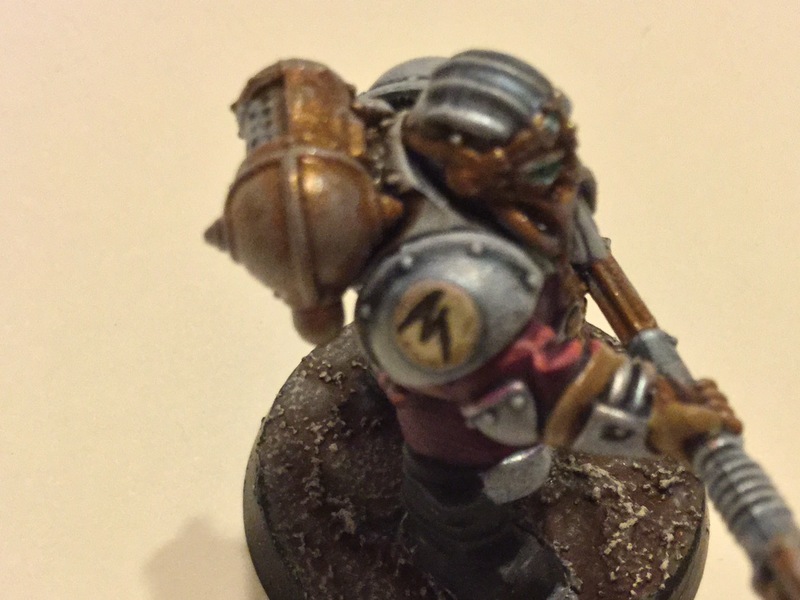 Painting this unit was a simple task, since the majority of the models were coated in silver spray paint. I tried to keep the colour scheme as close to the Barak-Nar imagery, so the unit will be recognisable on the field as part of Barak-Nar. 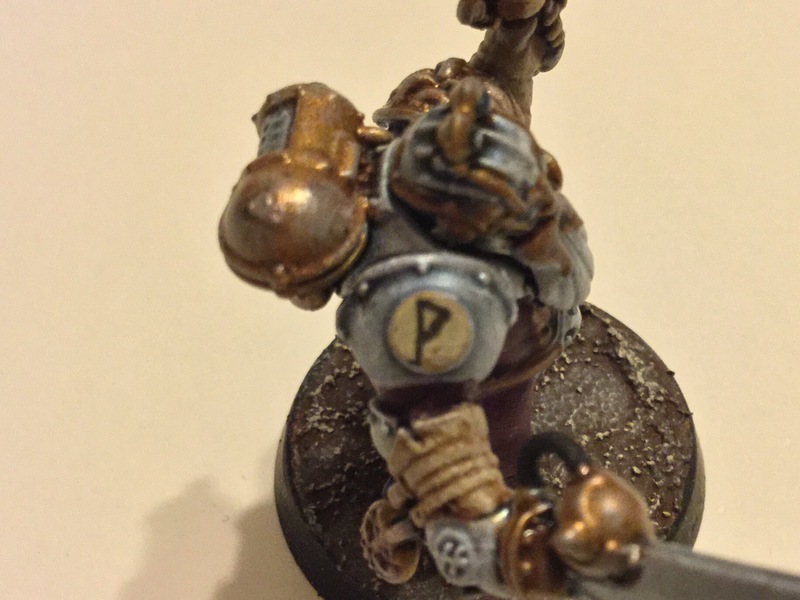 On their right shoulder guards, you’ll notice some Duardin runes inscribed on each Kharadron Overlord. The runes are actually from one of the old Warhammer Fantasy Dwarf supplement books (can’t remember which edition number it was, but I think it was released around 1995 onwards? ), which has loads of runes to equip (not for AoS sadly). So I’ve inscribed two runes for the unit, one being used through most of the troops, and a unique rune for the unit champion. My only criticism for the unit would be the shade I’ve used for the bronze, due to the glossy finish. Whilst I’m not keen on the gloss effect, overal I like the paint scheme. My goal now for my allies option will be to add a Frigate to the roster, which will be perfect along with Arkanaut company for a 2,000pt game. However, since I’m only using a 1,000pt army list currently, it’s none essential to get a Frigate for now. Next time, we return to the Lords of the Pisces, as the Stormhost finally taken it’s first steps out of Azyrheim. leaving the Celestial realm to wage war in the lands of a lost dynasty. 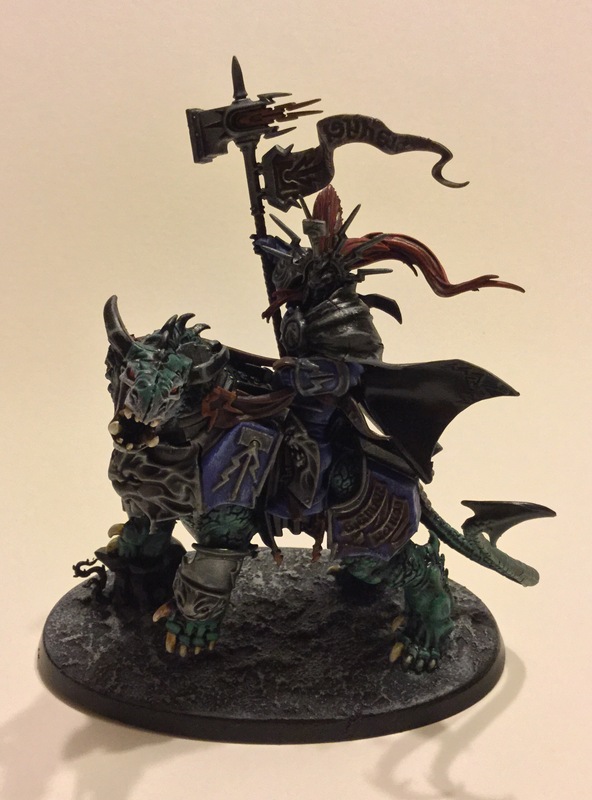 Leading the thunder strike is none other than Lord Celestant Bjorn the Stormborn, riding on top of his faithful Dracoth, Kivendorr. 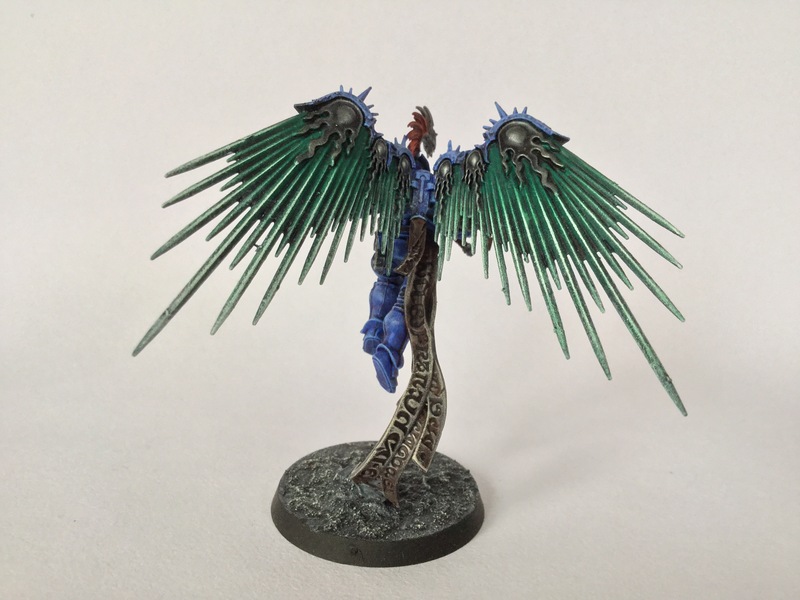 With hearts of cold vengeance tighten within each and every Stormcast Eternal, none are more cold and unforgiving as the Lord Celestant. Just a short post today showing some of the new feature images I’ll be using for my three main blog posts category’s. As well as the blog header image (which you can see the full image on the main page). The text and borders were made from the Photo Collage app, whilst the images were made using the Procreate app. 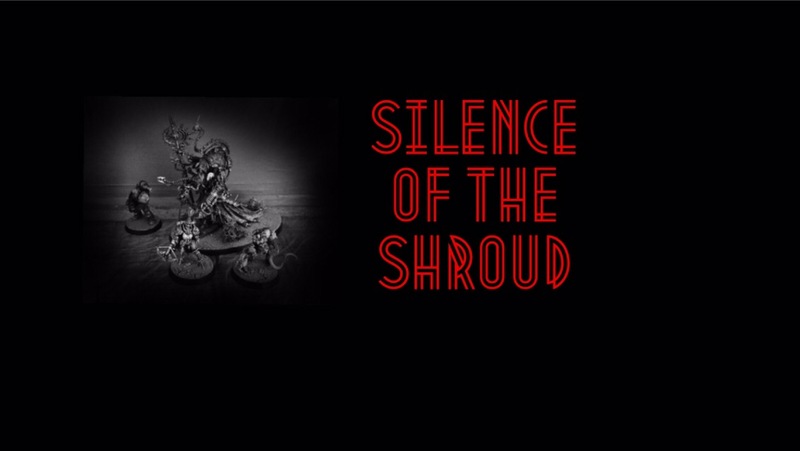 The new feature image for the ‘Silence of the Shroud’ collection series has a mysterious and dark noir tone, keeping to the roots of the grim dark 41st millennium. The main image for the blog site, a more professional image that now graced the main page. I personally think it’s a better replacement for my main page, as it gives the blog site more of an identity that’s recognisable. 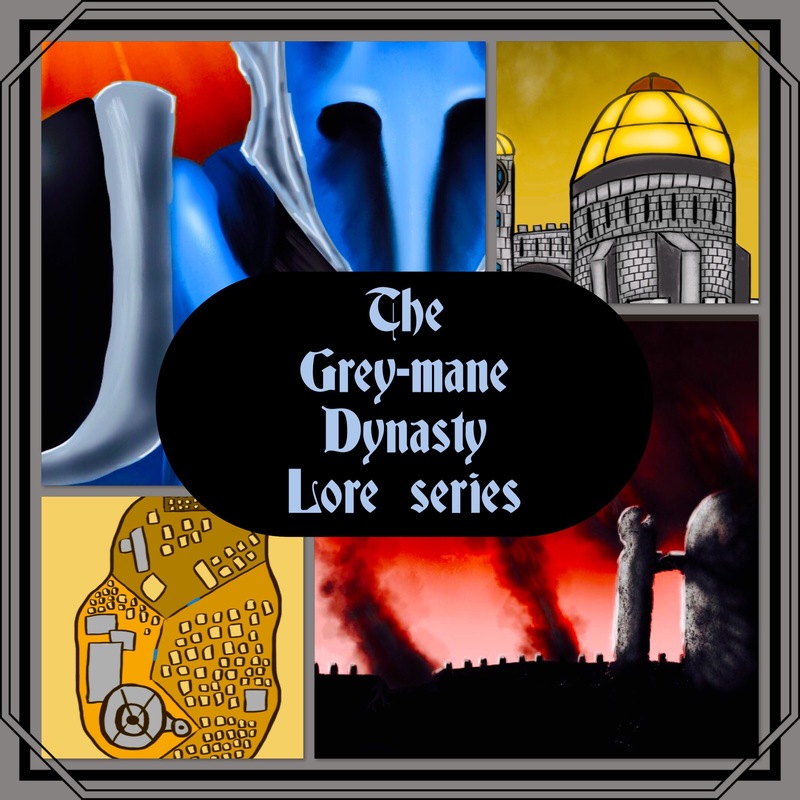 Continuing my homebrew lore series on the Grey-mane dynasty (set in the world of Warhammer AoS). I’ve created a collage that best represent the focus point for the blog post series. 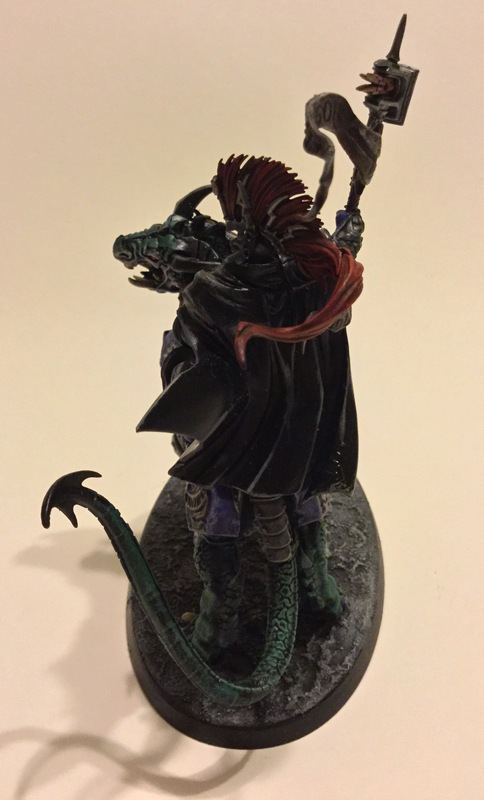 Most of you will have already seen this image from my first AoS faction collection post. I’ve used two of the same images back to back with a funky text style, I wanted a fresh and recognisable image that will be recognisable for readers. That’s all I have for now, I hope you have enjoyed this post I’m still working on the 40k image, nearly completed. I’ll let you guys know when that will be up very soon. As usual, if you have any questions, post a comment below and I’ll reply back as soon as I can. Thanks!